My brothers and sisters in Christ, I confirm your intuition that we are superior to many of our Christian siblings: Give yourselves a hand for another post-sunset Vigil! Do you know how many Vigils begin before Wheel of Fortune has ended?! But, our superiority notwithstanding, I’ve been troubled by this night for years. Sure, we outstay the sun; but overhead, high-pressure sodium vapor lamps blaze “at a characteristic wavelength near 589 nanometers.” Under their glare, we look like monsters or jaundice-sufferers; and their replacements aren’t much better: piercing LEDs blaze skeletal light between 4500 and 7000 Kelvin. I don’t think this is what Jesus meant by “the light of the world”. Still worse than bad artificial light is that the darkness itself is gone. Other than a closet or a cave, where can we flee from the ubiquitous stain of artificial light? Tonight, I want to take you back to a time when people knew darkness, and the Great Paschal Vigil was REALLY Great! So close your eyes, but remember to keep your candle upright! I’m going to channel the spirit of a beloved storyteller… Sophia Petrillo. Instead of saucy memoirs of her youth before emigrating to America—such as her torrid affair with Pablo Picasso— and moving in with The Golden Girls, we’re going back farther. Imagine you are gravelly-voiced Dorothy Sbornak, or promiscuous southern belle Blanche Devereaux, or ditsy Minnesotan Rose Nyland, and travel back with me…Picture it: Sicily. Twelve-hundred twenty-two. You gather in the darkened piazza before the Norman cathedral in your small city, the only light coming from the first vernal waning gibbous moon, from thousands of stars overhead, and maybe from a few torches burning at a cozy 1900 Kelvin. You don’t understand those lights, but you know that they order your year: planting, harvesting, traveling, and praying. They are teachers and guides. You look up one night, and seeing Orion’s belt, you’re reminded that it’s time to mend a fence, or hoe a row, or make a votive offering to help out your late, great aunt, who died under Orion’s belt a few years back, and who, you think, is in purgatory for 240,000 years—yet probably doesn’t deserve more than 50,000 of those. The clergy arrive. The Bishop sings something in Latin, strikes two rocks together under some dry straw, lighting the new flame, and a taper is lit from it, and the great Paschal candle from the taper. You all move into the cathedral. Picture it: that grand, vaulted volume, pitch-dark except for the spreading candlelight. Imagine no exit signs; opaque windows, unlit without our now-ubiquitous street lights. Imagine how you feel huddled in the dark in the darkest night of the year—the night when Jesus lay dead in the tomb. Keep your eyes closed as long as you like, but promise not to set your bulletin afire or drip wax on your neighbor’s new spring frock. Lest all this exposition confound you, or you wonder why this musician was given leave to prattle on about darkness and stars, I declare to you in this night of all nights that these images are not beside the point. They are the very heart of the matter. They are our jump seat from a “faith airplane” pulled down by religious precepts and dogmas. They are the trampoline on which we bounce upward from lifeless rationalizing to belief in the inexplicable. It’s easy to not believe stories about global floods, talking bushes, men living in fish bellies, virgin women bearing children, men bringing the dead back to life and returning to life after being murdered. We roll our eyes when hearing that Methuselah’s nine-hundred years old. I mean, c’mon, Methuselah, you look like hell, but isn’t that because you chain-smoked and spent too much time at the beach as a young man? 900?! To our enlightened credit here at SPR, we’re pretty OK with metaphor. If during coffee hour someone divulges an inclination to believe that The Man Upstairs really did create the heavens and the earth, et… al… , in six days, you might hold back a guffaw (and with it a blob of moist cookie), and opine that, if God did create the universe, God has been more impressive for having enough patience and persistence to spin out the project over 12 billion years. Way to go, God! Most of us would have gotten bored or distracted at least eleven billion years ago. becomes a lot more compelling, at least to my heart–soul–mind contraption. Composer Jonathan Dove took two short and disparate phrases from the Hebrew Bible, and gave us a sublime channel to contemplate the source of darkness and light, of life and death. I love the Great Paschal Vigil, because it, too, teeters between the sublime and the ridiculous. It is our most elaborately symbol-laden worship event, containing within itself the transformation of darkness into light, of mere words into inspiring stories, of tree sap into perfume, of oil into armor, of wheat and grapes into bread and wine, and of bread and wine into flesh and blood, of strangers into family, of death into life. It is the sensory smörgåsbord of the year, delighting with sight and sound and scent and taste and touch. It is also ridiculous. That we would “waste” a night off sitting in the dark, listening to these same old stories, eating a bite of bread. That a splash of water on the forehead could make us impervious to sin. Jesus came back from the grave? Walked through walls? Cooked a fish? Gathered a billion followers, practically none of whom ever met the guy, or even saw him on telly? Ridiculous! In his book, Religion for Atheists: A Non-Believer’s Guide to the Uses of Religion, English philosopher and self-identified atheist Alain de Botton argues that atheists cheat themselves of valuable life resources by dissing religion. Instead, Atheists should steal from religion, for what apart from it has given the world so much in the way of Wisdom, Community, Kindness, Education, Tenderness, Perspective, and Art? Between us and them, the gulf widens and narrows along its course. The average atheist asks the same questions we all wrestle with, and concludes that there can be no God. Yet we, with no more hard data than she has, are prone to gather in darkness, sing inspiring poetry set to lovely melodies, and converse with compassionate friends. Who looks wiser to you? Our liturgy, and especially this Great Paschal Vigil, is the Church’s greatest offering, buoying us across rough seas of doubt and despair, as it has for millions through the centuries. So, my friends, let’s exploit it! Be promiscuous in sharing it! Have you been to an SPR funeral recently? Maybe David Wallace’s or Glenda Mowatt’s? Or a wedding, like Lydia & Laurie’s? In all these cases the church was PACKED with visitors. 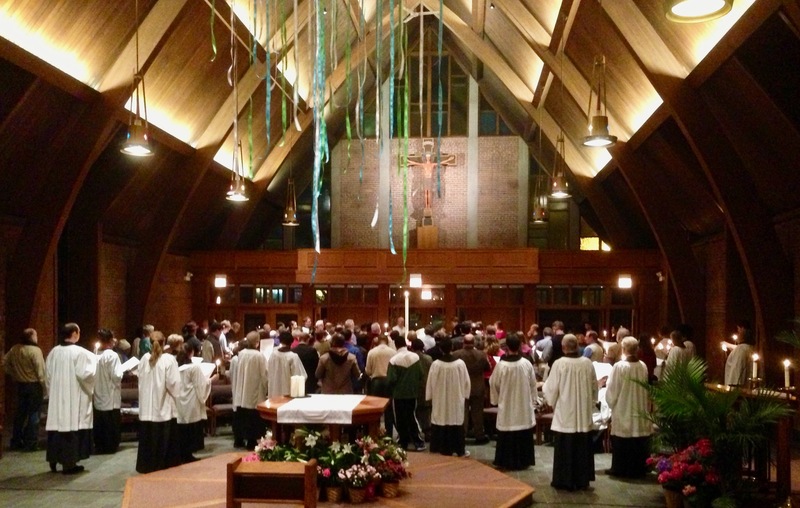 And those same visitors, whether churched or not, gushed about…the liturgy! About the preaching and music and the dignity and the beauty—and the welcome. I bet if they were here tonight, they would be transfixed and transformed! Invite them! To a world in need of solace and strength, we present our marriage liturgy, our burial liturgy, and our Great Paschal Vigil. All come with rich experiences; all name and invite our joy, hope, grief, anxiety, loneliness, and love at times of great importance in our lives—the creation of a new family, the death of a loved one, and the welcoming of a new Christian into the household of God; and each houses these actions and emotions within a time-tested framework that permits worshipers to rest in the knowledge that it’s all been done before, and there’s nothing to worry about. The liturgy supports us. Yet first, we promised to “continue in the apostles’ teaching and fellowship, in the breaking of bread, and in the prayers”. You see? Before we are sent out to continue the resurrection work God calls us to, we promise to let the Church inspire and nourish us through word and sacrament. Tonight is our feast of feasts. This resurrection work is immense, like God. Do you remember the words of the second half of Jonathan Dove’s anthem? The work of salvation is God’s work; it is Jesus’ work through his death and resurrection and the building of his Church. Yes, God needs us, but we also need to remember how small we are, how much we need God. We cannot do it alone, nor are we asked to. And then we can “go in peace to love and serve the Lord”, whose resurrection we both await and celebrate.